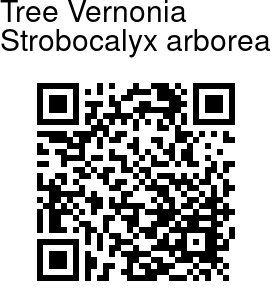 Tree Vernonia is a medium sized tree, growing up to 15 m tall. Bark is brown or blackish. Young branchlets are cylindrical and velvety. Alternately spirally arranged leaves are clustered at the ends of branchlets. Leaf stalk is 0.6-2.6 cm long, velvety. Leaf blade is 8.5-19 cm long, 4-11 cm wide, generally elliptic or slightly obovate. Tip is pointed or abruptly ending into a point, and the base is wedge-shaped. Margin is entire or sometimes distantly double toothed. Leaves are velvety on the underside. Pinkish purple flower-heads are borne in large panicled cymes, at the end of branches. Fruit is dry, ribbed, 1-seeded. 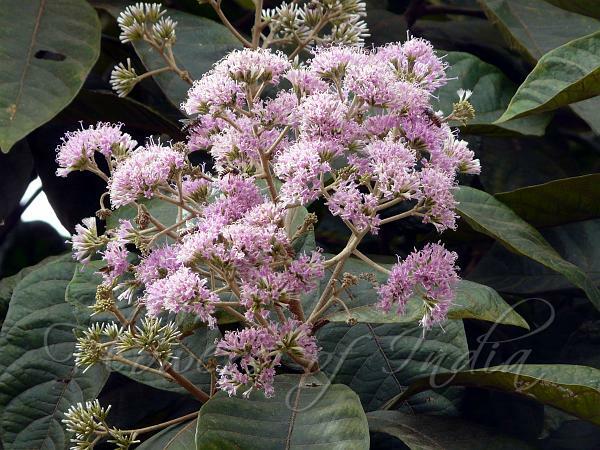 Tree Vernonia is found along margins of evergreen forests, up to 1900 m, in South and Central Sahyadris in Western Ghats and parts of NE India. Flowering: March-April.